RACEVIEW residents are living alongside a giant pile of exposed rubbish at least three metres high. The huge stockpile of trash sits on a block of commercial land within the Swanbank Recycling Park, less than 5km from a residential area. Within the pile of general waste old mattresses, plastic bin lids, old shoes, a traffic cone, a lounge chair cushion and a massive plastic drum can clearly be identified. On a sunny day, dust rising off the huge pile can been from across the valley at the historic Cooneana Heritage Centre on Redbank Plains Rd, some 4km away. The huge stockpile of trash has been there for at least a year. Environmental group Ipswich Residents Against Toxic Environments president Jim Dodrill said that when he visited the rubbish stockpile in September last year, it looked exactly the same as it does now. Mr Dodrill said his group lodged a complaint with the State Government after rubbish was spotted flying across the nearby road on a windy day. "The huge pile is just a symptom of the overall problem," Mr Dodrill said. "And the overall problem is that the council has allowed the dump industry to run out of control in Ipswich." When asked for comment Ipswich City Council indicated it was a State Government issue, as the works were associated with 'Rehabilitation' under a mining lease. The company that operates the site, Bogside Mining Industries, has a permit from the State Government Environment Protection and Heritage Department. The latest version of that permit was issued on November 17, 2016. The permit granted to BMI from the Environment Department includes 'Waste transfer station' listed under relevant activities which also includes clay brick and shale mining. 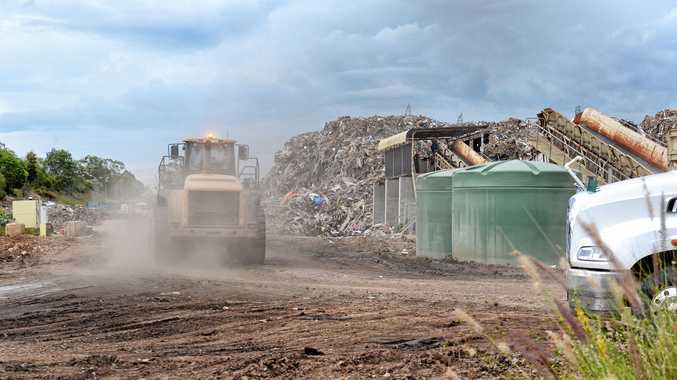 A spokesperson for BMI said the height of the permitted stockpile was progressively being reduced, with the waste transferred to licenced landfills, and while dust may be visible from a distance, the 40-hectare site created a significant buffer zone. "The site receives construction and demolition waste, which is processed into recoverable components," the spokesperson said. "These recoverable components can be used for site rehabilitation. A residual waste component is disposed of at licensed landfills. "We would be pleased to speak with any of our neighbours, who can contact our representatives on 1800 100 204." New figures released by the NSW Environment Protection Authority show that in the past year, the amount of rubbish coming across the border has doubled. During the 2015/2016 financial year about 430,000 tonnes of rubbish was brought across the border to be dumped in Queensland. In the 2016/2017 year that sky rocketed to 830,000 tonnes. Ipswich was labelled Australia's dumping capital earlier this year after an ABC Four Corners expose found huge volumes of rubbish was being trucked across the New South Wales border into Queensland. Most of that waste is being buried in Ipswich's commercial landfill sites, allowing southern waste operators to avoid paying the NSW dumping levy of $138 per tonne.